Kitchen Window: Baking A Little Invention Into Savory Cakes Savory cakes are wonderfully versatile. You can follow the basic recipe and add any vegetables you like — fresh, roasted or sauteed. If you add spices, cheese, capers, olives or even beans, you combine all of the elements of a meal into one satisfying package. I'm a mad scientist in the kitchen. My inventions for new culinary techniques that will revolutionize the way we eat usually happen in the middle of the night during a bout of insomnia. I stumble downstairs the next morning in a sleep-deprived daze, and a quick Internet search reveals that I'm far from the first person to have invented the cookery method, and hundreds of recipes already exist. I managed to feel smug about having invented savory cakes for some time, and not just because I'd given up researching my concoctions in order to avoid the inevitable disappointment. A cursory search didn't turn up too many results. I found some loaves of quick bread with olives or cheese in them, some "cakes" made of piles of crepes with savory fillings, and my 1963 copy of Mrs. Beeton's Everyday Cookery features a lurid photo of a cake made of layers of sandwiches (prawn, egg, ham salad) frosted with a thick coating of cream cheese. And of course we have crab cakes and fish cakes, but that's not quite what I was making. 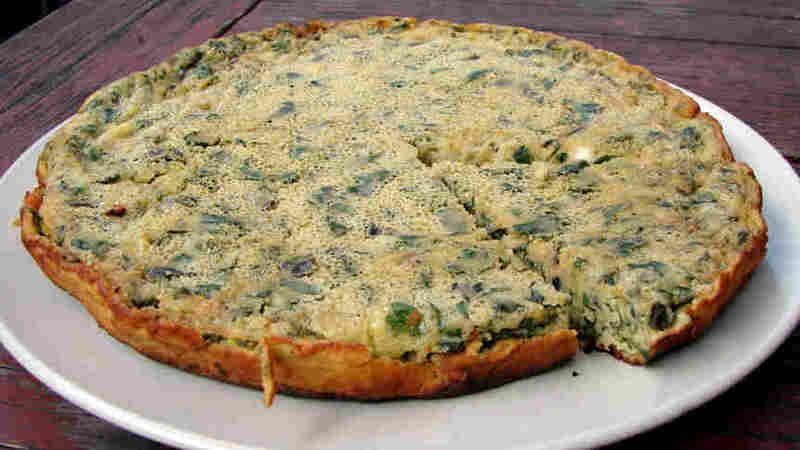 Savory cakes would make a nice brunch or special lunch, but I like them as the center of a hearty dinner. I was making big tasty cakes with vegetables and cheese mixed right into the batter or layered with the batter or piled on top. We'd found some large, beautiful antique French cake pans at a local flea market, and I had just collected armfuls of chard and fresh herbs from our CSA. I wanted to combine them somehow. 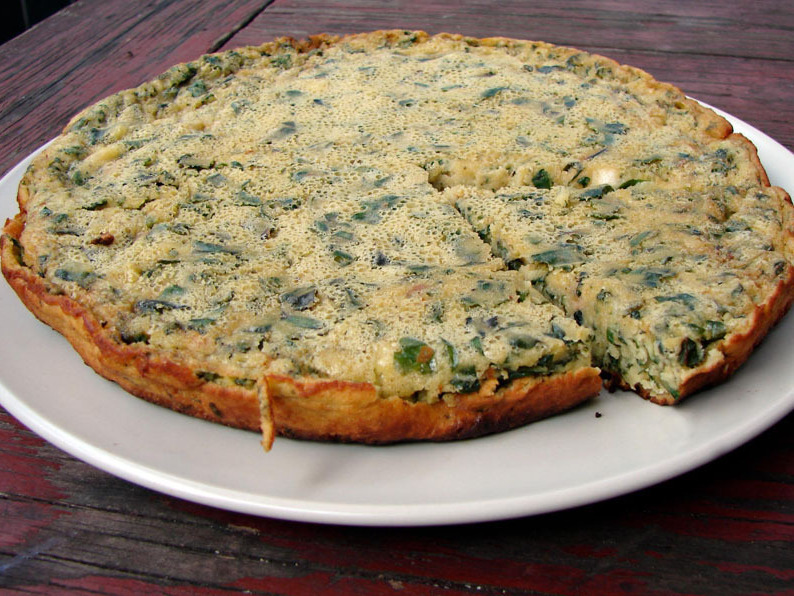 I wanted to whip up a batter flecked with fresh herbs and fill it with sauteed greens and cheese and bake it until it was golden and fragrant. And then I wanted to eat it looking out over our spacious Provencal estate, our abundant grove of olive trees, our verdant vineyard. Or, in our tiny, messy, but delightfully spring-green backyard. Of course, slightly more extensive research revealed that I didn't invent this one either. In France they speak of a "gateau salé," or salty cake. 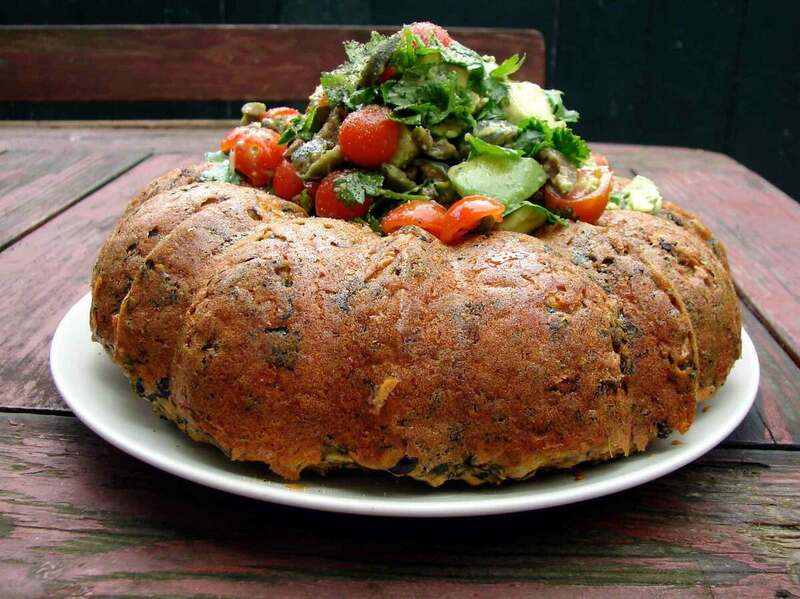 A gateau salé will often have ham, olives or cheese baked right in. Aside from this, I've found a few other examples here and there, but not as many as you might expect. We have savory pies (I'm a big fan) and savory pancakes, savory muffins and biscuits. A savory cake is simpler to prepare than many of these, and it marries the pleasant texture and comforting quality of a cake with bright complex flavors. Savory cakes are wonderfully versatile. You can follow the basic recipe and add any vegetables you like — fresh, roasted or sauteed. In the cooler months I like to grate butternut squash, mushrooms or cauliflower, toss them with herbs and olive oil, roast them until they're crispy and mix them right into the batter. They add their own particular element of sweetness, roastiness and umami flavor. In the spring and summer, I'll layer the cake with greens, greens and more greens, as well as asparagus, zucchini, artichokes or beautiful beets. Savory cakes are a perfect vehicle for CSA vegetables, particularly the greens and herbs that are starting to wilt by the end of the week. If you add spices, cheese, capers, olives or even beans, you combine all of the elements of a meal into one satisfying package. Claire Adas is an independent filmmaker and freelance writer based in Lambertville, N.J. She writes about food, music, film and life on her blog Out of the Ordinary. You can fortify the batter and make it more interesting with the inclusion of ground nuts or different types of flour. I've used ground almonds, walnuts and hazelnuts, semolina flour, corn flour, masa harina and chickpea flour, and they all add a depth of flavor and a nutritional boost. A sauce or salsa livens it up and provides a contrasting texture. And when do you serve this culinary anomaly? Not for dessert, obviously, and not on the side, like a quick bread. They're too complicated and substantial for that. Savory cakes would make a nice brunch or special lunch, but I like them as the center of a hearty dinner, with roasted potatoes and something bright and green — a salad or a simply prepared vegetable. Cakes have long been associated with celebrations, with parties and visits and gatherings. These pretty, festive savory cakes continue that tradition and take it in an unusual new direction. My research into savory cakes is obviously far from exhaustive. I'm sure that other examples can be found in different cuisines and different cultures. But I'm sticking with my story that I, kind of, invented them. Loosely inspired by French socca, this cake combines chickpea flour and regular flour with eggs and leavening to make a light but substantial cake. Chard, rosemary and mozzarella make it flavorful and nourishing. I served it with a Spanish-style sofrito, a thick, jammy, long-cooked tomato sauce with red pepper and olives. Chickpea flour is available at most supermarkets, health food stores or Indian grocery stores. Combine the chickpea flour, all-purpose flour, salt, plenty of pepper, baking powder and rosemary in a large bowl. Whisk in the milk. You should have a thickish batter. Leave that to sit while you cook the chard. In a large skillet over medium heat, warm the olive oil. Add the garlic and red pepper. When the garlic starts to brown, add the chard, with water still clinging to its leaves (or with a few tablespoons of water). Stir and cook about 10 minutes, until the chard is wilted but still bright, and the pan is quite dry. Set aside to cool for a bit. Whisk the eggs into the chickpea flour mixture, one at a time. Whisk until the batter is fairly smooth. Stir in the cheese, basil and chard and mix well. Melt the butter in a 9-inch frying pan with a metal handle. You want to keep the heat fairly moderate, so you don't burn the bottom. When the butter starts to brown, pour in the batter. Cook for about 7 minutes. The edges will start to look brown, and the top will start to bubble and lose its shininess. Put the whole pan into the oven, and cook for about 10 more minutes, until the top is just golden, dry and firm and bounces back lightly when pressed. It will be covered with tiny bubbles. Take the pan carefully out of the oven. Let it cool a few minutes, and then slip a spatula carefully around the sides to loosen it from the pan. I used a pie server at first, to lift it, and then slipped a larger spatula under. Transfer to a plate. Cut in wedges and serve. Heat the olive oil over medium heat in a large saucepan. Add the shallot, and when it starts to brown add the garlic, rosemary and the red pepper flakes. When this starts to brown, add the paprika and then immediately add the tomatoes, peppers and olives. (If you leave the paprika in hot oil too long it will burn and get bitter). Let the tomatoes come almost to a boil, then reduce heat and simmer. Let simmer on medium low heat for a long time — up to an hour. First the mixture will get very juicy, then dry out, then become more of a paste and less of a sauce. And at some point, the tomatoes will separate from the oil, which will be a beautiful reddish saffron color. That's how you know it's done. You don't have to stir constantly, but it's a good idea from time to time so tomatoes don't stick and burn. If you have to add a drop of water now and again, toward the end, that's fine. Season with salt and pepper, the butter and balsamic vinegar. This pretty, colorful cake is loosely based on a gateau Basque, in which jam or cream is piled between layers of batter. This filling of grated toasted beets with their greens, goat cheese and asparagus is bursting with spring flavors. In a food processor, chop the almonds until ground. Add the flour, salt, plenty of black pepper and baking powder and process until mixed. Cut in the butter in small pieces and process until mixed and crumbly. Add the eggs and process until smooth. Add the milk and process until smooth. Preheat the oven to 425 degrees, or use your toaster oven. Combine the beets, balsamic vinegar and 1 tablespoon olive oil and toast or roast until dark and fragrant. They will be crispy on the edges but soft in the middle. It should take 15-20 minutes. Bring a large pot of salted water to a boil and drop in the greens. Boil for about 10 minutes (slightly less if you're only using chard). Put the asparagus in a strainer over the boiling water, cover and boil for a few minutes until bright green and tender. Drain. Run cool water over the greens and drain, ringing in your hands until as dry as you can get them. Chop them fine. Warm the remaining 1 tablespoon of olive oil in a large skillet over medium heat. Add the garlic, pepper and herbs. Cut the tips of the asparagus 2 or 3 inches long and set aside. Chop the rest of the asparagus into small pieces. Put these in the skillet along with the greens, stir to combine and cook for a minute or two. Season with salt and pepper. Preheat the oven to 425 degrees, and put a generous coating of olive oil in a large cake pan or small roasting pan. Pour half the batter into the pan in an even layer. Top with the greens, leaving about 1 1/2-inch margin all around. Layer the mozzarella over the greens. Add the goat cheese to the toasted beet and stir just to combine. Layer this over the mozzarella. Pour the remaining batter over the top, spreading with the back of a spoon to fill in any holes and make a smooth layer. 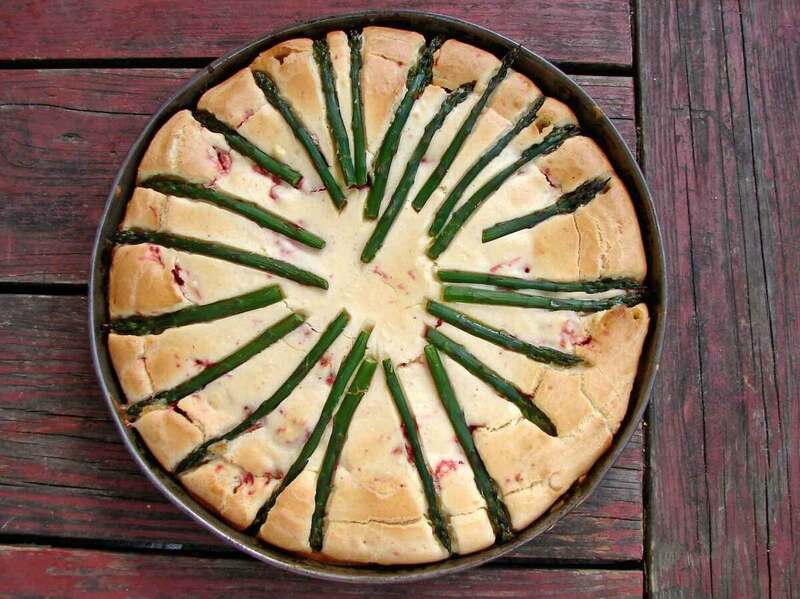 Arrange the asparagus spears prettily on top. Bake for 20 to 25 minutes until the top is puffed and golden. Let cool slightly, slice, and serve. Although this cake is yeasted, it's decidedly not a bread, the addition of butter, eggs and baking powder give it a lovely soft crumb, which makes a nice contrast to the strong flavors of olives, capers and fennel. We ate this with a light, fresh tomato and white wine sauce. Combine the yeast, sugar and 1/2 cup warm water in a large bowl and leave in a warm place for about 15 minutes, or until frothy. Add the butter and stir until nearly melted. Beat in the egg. Add the dry ingredients and beat until smooth and sticky. Add the remaining cup of warm water and beat again until light and frothy. Cover with a damp cloth and leave in a warm place to rise. After about 1 1/2 hours, beat the batter again and then leave to rise for another hour. Or, you can leave the batter for a few hours and omit the second rise. *I used chives, sage, rosemary, savory, thyme and oregano, but use whatever you have on hand that you enjoy. Dried herbs will work well, too, if that's all you have. Melt the butter in a large skillet over medium heat. Add the garlic and stir and fry for under a minute until it starts to brown. Add all of the herbs, stir and cook until they begin to sizzle. Add the fennel and cook for a few minutes until it softens, turns translucent, and starts to brown. Add the olives and the capers. Pour a splash of white wine in the pan and stir to deglaze the bottom of the pan. Add the greens and a few tablespoonfuls of water. Cook until the greens are wilted and tender but still bright and the pan is quite dry. Stir in the balsamic vinegar and season well with salt and plenty of freshly ground pepper. Butter and flour a large cake pan. Pour half the batter into the pan. Yeasted batter is a funny consistency, so you might have to coax it to the edges of the pan. Make it as smooth and even as possible. Top the batter with the vegetable mixture, trying to distribute it evenly and leave a border of about an inch around the edge. Top with an even layer of cheese. Pour the rest of the batter over, smoothing it to the edges, and covering in any holes that form. Let this sit for at least half an hour. Bake the cake for 25 to 30 minutes, until it's golden brown and firm to the touch. Let cool slightly, slice and serve. **If they're very seedy, give them a gentle squeeze to get some of the seeds out. Melt the butter in a medium-sized skillet over medium heat. Add the garlic and cook for under a minute until it starts to brown. Add the tomatoes, rosemary and smoked paprika and stir to coat with butter. Cook for a minute or two until the tomatoes start to soften. Add the wine, and cook until it's reduced and syrupy. Add enough water to make the dish saucy again, and cook until the tomatoes are falling-apart soft, about 10 minutes. You can break them up a bit with your spoon as you stir. Stir in the balsamic vinegar, season well with salt and pepper and serve. Serve on the side to be spooned over the cake. Rich with earthy flavors, smoky cheese and the pleasant texture of cornmeal, this is a hearty, satisfying cake. I baked it in a Bundt pan and then piled the center with a fresh green avocado-castelvetrano olive guacamole, but you could bake it in a large cake round or square cake pan instead. I sliced the leftover cake to make savory French toast, topped with a spicy smooth chipotle tomato sauce. *I buy a small can of chipotle peppers in adobo sauce, purée them and store them in the refrigerator. In a large bowl, beat the eggs until light and fluffy. Add the corn meal, flour, salt, baking powder and baking soda. Mix well. Pour in the beer and stir to combine. You should have a fairly thick batter. Add a little more beer if necessary to loosen it up. Stir in the grated cheeses. Meanwhile, put the kale in a big pot and cover with water by about 1 inch. Bring to a boil over medium-high heat and cook for 8 to 10 minutes, until the kale is quite soft but still bright. Drain, let cool until you can handle it (or run under cold water) and chop fine. In a large skillet over medium heat, warm the olive oil. Add the shallot and cook for under a minute until it starts to brown. Add the garlic and herbs, stir and cook for about half a minute until they start to brown. Add the black beans and stir until they're coated, then add the chipotle puree and the tomato paste. Stir and cook for a minute or two. Add the paprika and cumin and about one tablespoon of water. Cook until everything is heated through and the pan is quite dry, 4 or 5 minutes. Let cool slightly. Add the kale and beans to the batter and mix well. Generously coat a Bundt pan or other cake pan with butter or olive oil. Pour in the batter, trying to make it even and smooth. Bake for about 25 minutes until it's puffed and golden and firm to the touch. Let cool slightly, slice and serve. Combine everything in a small bowl and lightly toss. 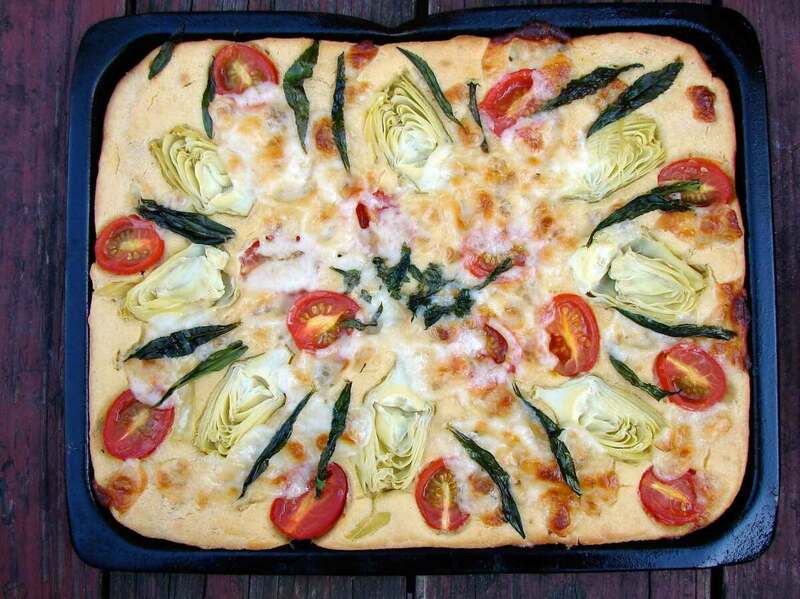 In this cake, the vegetables and cheese are piled on top in a pretty pattern, and the cake bakes up golden all around it. The bright lemon-anise flavor of tarragon contrasts nicely with the nutty flavor of chickpea flour. I served it with a saucy mix of beans, greens and truffle butter, but a simple tomato sauce would work nicely as well. Chickpea flour is available at most supermarkets, health food stores or Indian grocery stores. In a large bowl, combine the flours, the salt, pepper and baking powder. Beat in the olive oil and eggs and add enough water to make a thick batter — 1/2 cup should do it. Let the batter sit while you preheat the oven to 425 degrees. 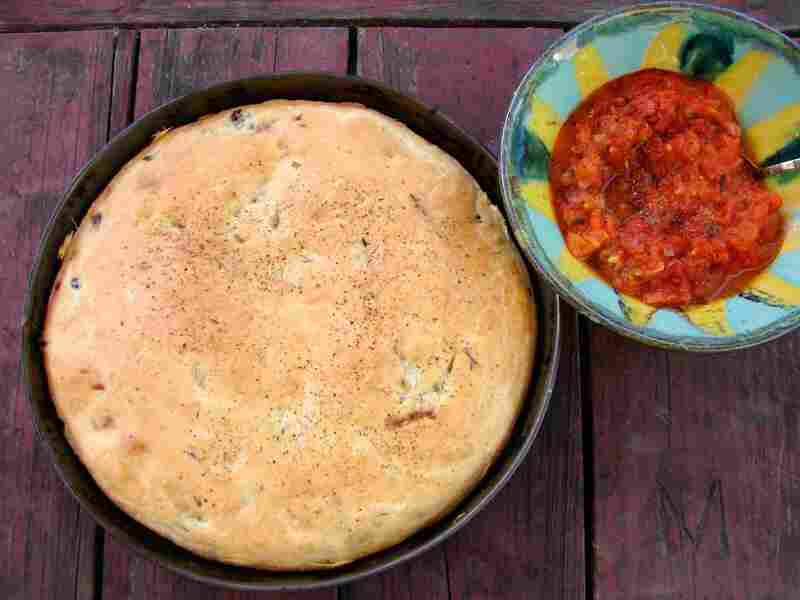 Generously coat a small baking pan or large cake pan with olive oil. Spread the batter in an even layer. Arrange the artichoke hearts, tarragon leaves and tomatoes in a pretty pattern. Scatter the cheese all around them. Bake for 25–30 minutes, until the cheese is melted and bubbly, the chickpea flour cake is puffed and brown on the edges. Let sit for a moment, and then serve with some sauteed greens, or any kind of sauce you like. Warm the olive oil in a large skillet over medium heat. Add the pepper flakes and garlic if you're using. Add the white beans and stir and fry a bit until they're warm. Add the spinach and cook until it's just wilted and bright. Add a little water if necessary to loosen it up. Stir in the truffle butter, and season with salt and plenty of black pepper.